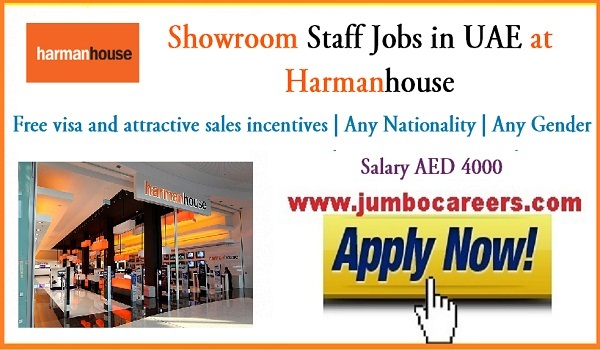 Retail and Marketing division of Harman Group Middle East- Harman House hiring showroom staff. This is a direct and free recruitment with Free visa and attractive incentives. Experience is the same field is an advantage. Visit and canceled visa can also apply. About the Company : Harmanhouse is the retail & marketing arm of harman Middle East in the United Arab Emirates which commenced its operation in August 1999. harmanhouse was established not only to handle the UAE distribution of harman Middle East but also to showcase our products to our distributors and dealers who periodically visit our stores to understand the products and adopt the state of the art technology in their respective territory. Interested candidates may send their latest resumes to: jobs@harmanme.com with subject as job title.